How about a cocktail for your Thursday? Start happy hour early with this new concoction, a twist on the classic French 75 cocktail. In honor of the final episode of Downton Abbey this weekend, I’ve decided to name my version The Lady Cora. Don’t be fooled into thinking it’s sweet and feminine. This cocktail packs a punch. 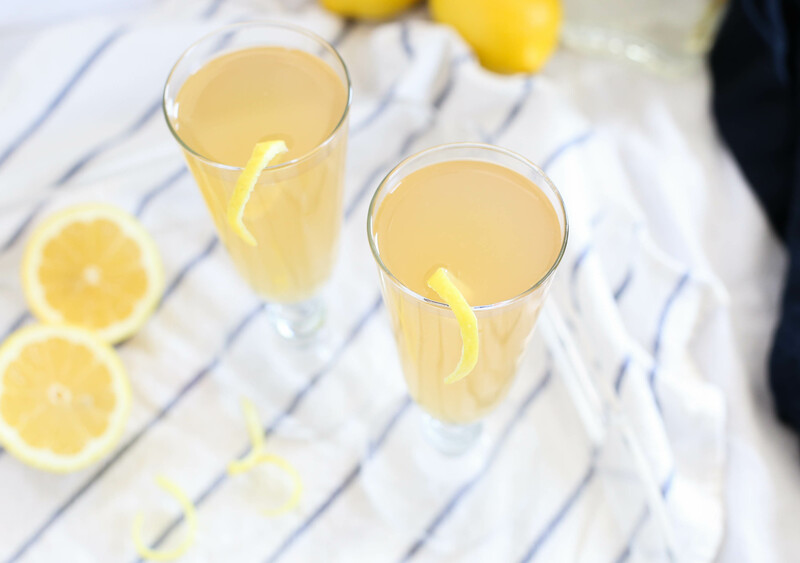 Whether you are a current Downton fan, have some catching up to do, favor upstairs or downstairs, or just need a drink, make this. Make this now. This Sunday marks the finale of the Downton Abbey series. I have followed the entire series closely, along with my entire family – we actually have extended phone conversations about it. (Can you believe Edith? Carson was such a grumpus this episode…etc.) I’m sad to see it come to an end, but have immensely enjoyed this final season. While a cup of tea would probably be the most suitable, for some people – myself included – a stronger libation is more appropriate. Enter the champagne cocktail. To create my cocktail, I started with a French 75. 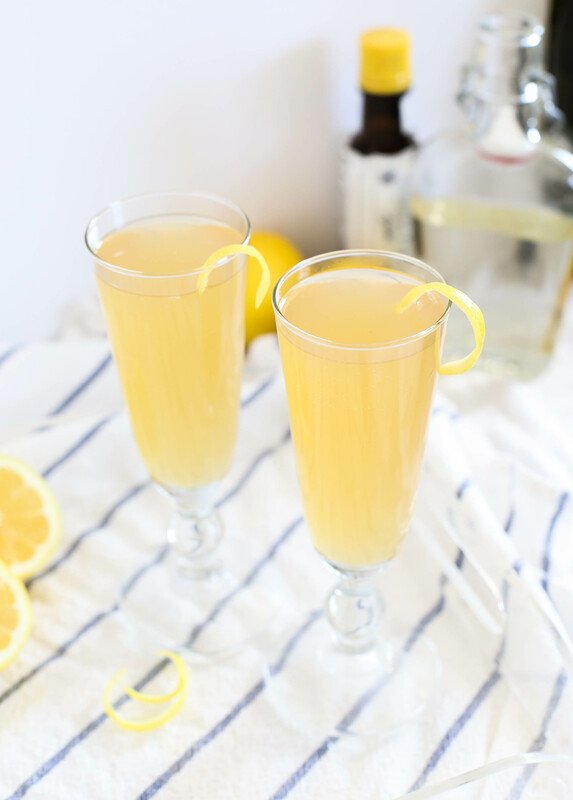 This popular cocktail was created in the 1920s and is composed of gin, champagne, lemon juice, and sugar. I put an American twist on the classic by adding bourbon whiskey instead of gin. This, along with the fact that it’s a substantial cocktail for anyone that can hold their own, led me to name it after Cora: an American at Downton, and one of the most resilient characters on the show. For the lady or gentleman, this is not a girly drink. Also in full disclosure it’s directed more towards whiskey drinkers. You can taste the spiced notes yet it’s still refreshing, so this would be a great year-round recipe. The 1920’s have been called the golden age of the cocktail, and indeed cocktails have made their way onto Downton Abbey over the last two seasons. The cocktail hour gave guests more of a chance to mingle before dinner. At one point the Crawleys even threw a cocktail party instead of a multi-course dinner affair. The Savoy Cocktail Book, by barman Harry Craddock came out in 1930 (with a whopping 750 recipes) and included the French 75 (the drink also makes an appearance in Casablanca). 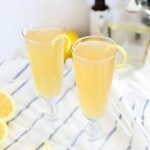 I was introduced to the French 75 last summer at a best friend’s wedding. Ever the sucker for a champagne cocktail, I have loved it ever since. For my salute to Downton I wanted to create a suitable, stylish cocktail that is easy to make at home. Champagne is all well and good, but add a couple more ingredients and you get something even better. Bourbon, lemon juice (fresh if possible), simple syrup and bitters are stirred together before the drink is topped off with champagne. If you decide to make a large batch of this recipe, fill each glass about 3/4 full and then top with champagne. And don’t forget the lemon twist, it adds something too. Simple syrup only takes a minute to throw together. You place equal parts of water and sugar into a saucepan and simmer until the sugar is just dissolved. Since only a small amount is needed for these cocktails, you can store the rest in the refrigerator for sweetening coffee or iced tea. The Lady Cora is a drink meant to be sipped, not thrown back. It is a smooth drink that looks all innocent (and almost peachy?) and then “hits with remarkable precision.” Make one for you, for your significant other, for your mates. See you on Sunday night! Cheers! 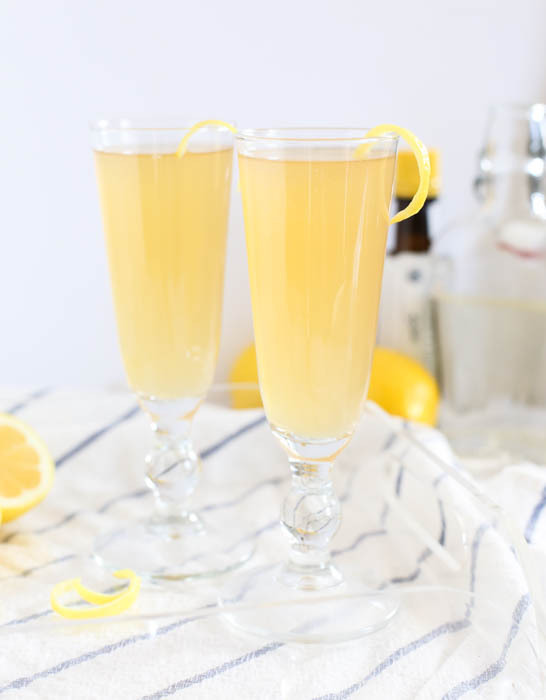 An American twist on the classic French 75 cocktail. Add one cup of ice to a cocktail shaker or mixing glass. Pour in the bourbon, lemon juice, simple syrup, and 2 dashes of bitters. Stir with a spoon until chilled. Strain into a champagne glass and top off with champagne. Serve with garnish.